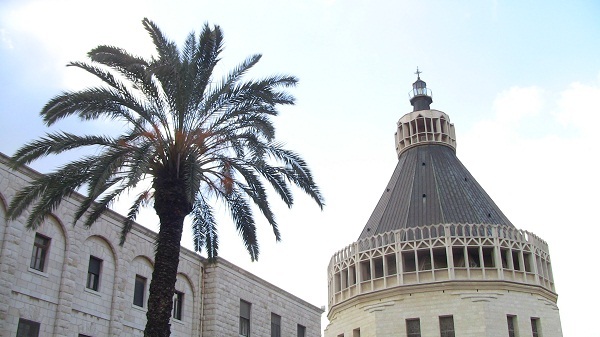 The church in Nazareth commemorating the Annunciation to Mary. ISRAEL – I write this post from Tiberias, a city beside the Sea of Galilee. I am currently traveling in Israel with the Canadian Church Press on a week-long tour of the Holy Land. The event, which is sponsored by the Israel Government Tourism Office, has been a fascinating opportunity to see the land in which so many stories of the faith took place. Our journey began Monday with our arrival in Tel Aviv. This harbour community, Israel’s largest city, is built in the same area as the biblical Joppa, which exists to this day. While we spent no real time visiting this city, it was a fitting place to begin our travels. This is an area important in Scripture as a place of entrance to and exit from Israel. Joppa was the city to which Lebanon sent cedars over the Mediterranean Sea when Solomon was building the temple in Jerusalem (2 Chronicles 2:15). It was Joppa also from which Jonah set sail in an attempt to run away from God and his command to go preach repentance to the Ninevites (Jonah 1:3). 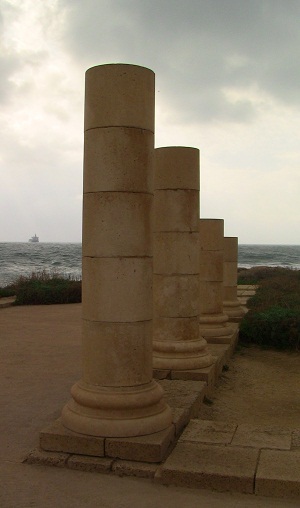 Columns marking the edge of the palace in Caesarea, overlooking the Mediterranean Sea. On Monday, we explored the ruins of Caesarea, a city built by Herod the Great. This is the Herod who slaughtered the young boys of Bethlehem in an attempt to kill the Christ child. Caesarea is now in ruins, but even in ruins it is an awesome place to behold. It was here, perhaps, in the stones which were once Herod’s palace that St. Paul stood before King Agrippa II and Bernice, and the Roman governor Festus, bravely confessing the faith (Acts 25-26). Here also St. Peter, after having received a vision from God in Joppa, met with the Roman Centurion Cornelius and first proclaimed the Good News of Jesus Christ for Gentiles: “Truly I understand,” he explained, “that God shows no partiality, but in every nation anyone who fears him and does what is right is acceptable to him” (Acts 10:34-35). Tuesday we moved back in time from the witness of the Apostles to the ministry of Jesus Himself. In Nazareth, we visited the church built over the ruins of what is traditionally believed to be the home of Joseph. So too we visited the church commemorating the Annunciation to Mary, its massive structure honouring the humble faith of the mother of Jesus. Told she would bear the Christ through miraculous virgin birth, she acquiesced to the Father’s will: “Behold, I am the servant of the Lord. Let it be to me according to your word” (Luke 1:38). Following the flight to Egypt from Bethlehem, Joseph and Mary returned to Nazareth with Jesus, and in that town He grew to adulthood. Sadly, it was also this town which so firmly rejected Him, doubting Him and even attempting to throw Him off a cliff (Luke 4:16-31). We gathered at the point on the mountain traditionally believed to be the cliff from which the people of Nazareth attempted to throw Jesus, reading the story aloud from the Scriptures. From there, we followed Jesus to the town He moved to after His rejection in Nazareth: Capernaum. Here we saw fabulous ruins marking the houses and borders of the small fishing village of Jesus’ day. We saw the place traditionally held to have been Peter’s home, and noted how near it (and all the houses in the village) were to the synagogue where Jesus taught and cast out a demon (Luke 4:31-36). Ruins of Capernaum, with the remains of a fourth-century synagogue reassembled on the site of the synagogue Jesus preached in. 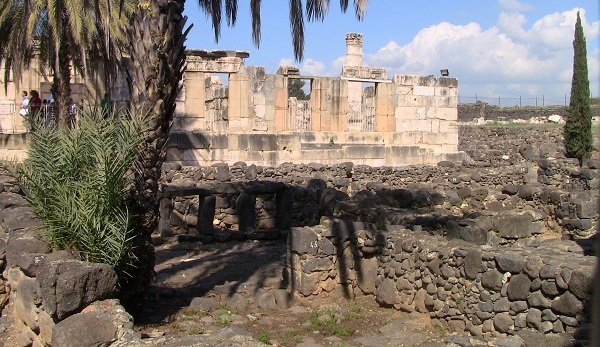 The ruins of Capernaum lie on the coast of the Sea of Galilee. In this area Jesus performed many of his miracles and spoke to numerous crowds. We visited in this area the hill from which Jesus is believed to have given the Sermon on the Mount (Matthew 5-7), and even took a boat ride across the Sea of Galilee—that place where the first four apostles called by Christ once served as fishermen, the place where Jesus calmed the storm and walked on water. So end our journeys from Monday and Tuesday. But the journey for Christ, of course, did not end in Capernaum. It continued on to Jerusalem. And before this week is complete, we too will follow Him there to behold for ourselves the place of His crucifixion and—thank God!—resurrection. Mathew Block is Communications Manager for Lutheran Church-Canada and editor of The Canadian Lutheran.